This week, I’m excited to introduce Dorina, otherwise known as Dee/Decade Thirty as a co-host. She’s been one of my closest friends ever since I joined the Bullet Journal community way back in 2014 and I’m delighted to have her join along! As I was assembling the Facebook group for the book club and furnishing it with posts, one of the posts was an invitation for others to co-host if they were interested in helping lead the weekly discussions and possibly hosting in-person meetings. Dee reached out and has been helping out ever since. I’m grateful she wanted to be part of this! She’s developed a lot of the early materials such making printables for the Weekly Reading Plan (see below) and regularly contributes her incredible handwriting for the weekly graphics. Join me in giving her a warm welcome! She’ll be sharing this week’s discussion points. Hi everyone! My name is Dee and I curate and maintain a little internet and social media space called Decade Thirty. Bullet journalling has kept me organised through many life milestones and changes since its inception in 2013. I’m honoured and excited at the opportunity to work with Kim in generating topics of discussion, and joining in the conversations around the Bullet Journal method book. Welcome, everyone, to the very first chapter and first week of discussions. Kim and I (Dee) have been blown away with your interest and level of enthusiasm for this book club, and wanted to say a massive thank you to all of you. 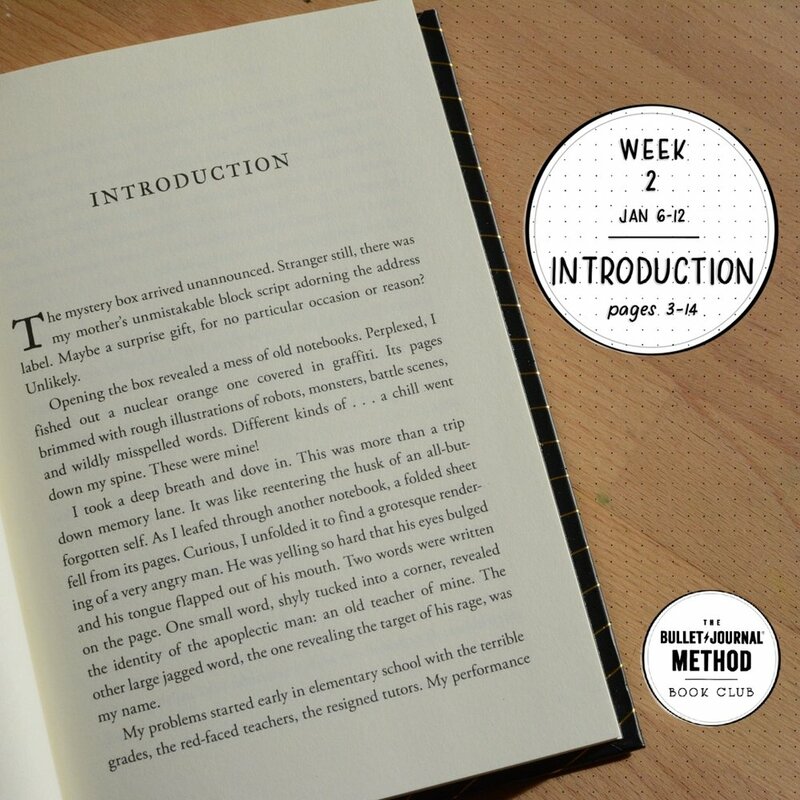 • In this chapter, Ryder goes in detail about the history and genesis of the Bullet Journal system - everything from his struggles as a child which led him to developing his own system of capturing his ideas, tasks, lists, etc. that eventually led to the system it is today. What was your moment of realization (or pivot point) - the one that led you to try the Bullet Journal system? If you didn’t have this “moment” or pivot point, what spoke to you in this chapter? • If you could describe your Bullet Journalling style in 1-2 words, what would it be and why? Is this currently working for you? If yes, how? If no, what would you change? Again, feel free to post your responses below in the comments, and we encourage you to reply to other members’ insights and responses (with respect and kindness, of course). Happy first week, book club members! I listened to this chapter again this morning via the Audible version and so much of what Ryder said resonated - from how I’ve felt to what I’ve noticed in the community. I felt like my “moment” was more of a journey. I had been putting together the pieces of what I wanted my own notebook system to be when I discovered Ryder’s Bullet Journal video and realized that it was exactly what I was looking for. I would describe my style as, “anything goes” and that’s still true to this day. Giving yourself the liberty to create what you need to, while having the simplest parts to make it all work, is what’s most compelling to me about all of this. Ryder really struck gold refining his system over the years and sharing it with us. This week, I took the photo you see above. Dee wrote out the words for the week’s topic and created the dot grid background. I put it all together and it was fun to see the dot grid elements all over the place on the desk and circle and such.